This interview took place during the above-mentioned exhibition. Kawase Shinobu (1950 - ) is one of Japan's leading celadon ceramic artists. He was the youngest potter ever to be awarded the Japan Ceramic Society Prize in 1981. Click here for more on the topic of celadon. Kawase Shinobu's celadon has been attracting many people for some years now. There is nothing to compare with the softness, smoothness, and warmth of his celadon. Sometimes it seems like a living form. 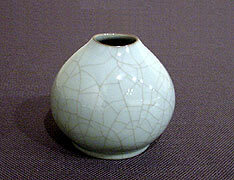 His celadon is uniquely shaped; it looks like it might cave in when pushed, as Kawase describes it. Among numerous celadon works, his ceramic art established his own original world. He never fails to surprise us every time he presents his latest works, and this exhibition is no exception. Q: Your first work I saw was an incense burner with three very long legs. It was totally different from other celadon works! I was very surprised to learn that there was such a wonderful artist. Let us talk about this exhibition. You have often presented works inspired from the shapes of creatures, like a crane, penguin, jellyfish, ray, etc. The latest works seem different from past ones, don't they? A: Yes. My latest works are different. In my older works, an edge on a piece was crooked, or the legs on incense burners were flabby. But this time, I made the mid section flabby, instead of an edge or legs. When I make a shape with clay, I usually form the shape first and scrape it to completion when it is semi-dry. When clay is semi-dry, or when it has a little water left within, it can be softened again by being moistened and can be reshaped. I used this method of shaping clay for my latest works. First I form a shape and scrape it to the limit. The result of scraping is a full round shape. I cover it with plastic not to let it dry completely. When the clay is semi-dry, the edges become dry naturally and get hard, but the midst of it, or the torso of the work, is still moist. I make the moist area even wetter by using a brush or spray, and when it becomes soft to a certain extent, I manipulate it to create curves and crooked edges by pushing in and out. 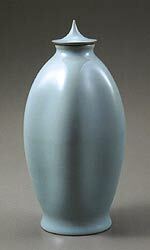 Celadon Mizusashi, or water jar (crooked torso). When looked down upon, it has the shape of a pentagon. Q: First, what is Monkou Yuseiko? A: It is a part of a poem written by the emperor of China's Qing Dynasty, Qian-long. There is a vase in the Palace Museum in Taiwan and the above poem is written on the back. "Monkou" means hitting or stroking. Therefore, the poem means something like "when it is hit or stroked, one can hear intemerate sounds." Probably, Qian-long was trying to say that this vase from the Southern Sung Dynasty makes intemerate sounds when it is touched or stroked. But since I used the technique of hitting and stroking to make my recent works, I kind of borrowed the expression. Q: What about the next part, "Quintessence of clay?" A: It was indeed "moisture." But it would not sound good, so I changed it to sound cool (laugh). The part means that if there is a little water left, plasticity (stickiness that will allow clay to be shaped when it is crooked) will revive. Q: Have you been influenced by Korean culture? A: I did not think I was, basically. But this time was a little different without being conscious of it. One of my friends who saw the photo on my exhibition's announcement card said to me, "This is a bit like Yi Dynasty works. Your works have changed a lot." (laugh) I focused on the softness this time, not the sharpness as usual. That might be the reason why they became Yi-Dynasty like, I do not know. When it is pointed out, I kind of agree. Q: What made you choose to make celadon works? A: My family has been a Yakimono-ya (pottery makers) for the last three generations. We have made with Shonzui (a type of blue and white porcelain), red overglazed enamel ware, and overglazed enamel and gold decoration; I am the only one making celadon. [NOTE: Shinobu's grandfather was Kawase Chikushun I, and his father is Kawase Chikushun II] Because I grew up in that kind of family, I got into this field when I was 18 years old, but it was not like I wanted to. My grandfather insisted that I become a yakimono-ya. It was like being trapped. (laugh) My family used to make pots for restaurants in the past. There were two processes, shaping a pot and drawing on it. I was not allowed to draw at all for a while. Even when I was becoming capable of throwing pots on a wheel, my father told me that I must not draw. Although I was learning drawing with a painter of Japanese-style painting, I was not allowed to draw on a pot. In about a year's time, I began to want to make my own works; a person naturally develops desire. About the same time, when I was looking at a finished sometsuke (cobalt blue underglazed ware) piece, I noticed that the area where the glaze was a bit thicker had turned blue. I learned that thick glaze would turn blue. Then, I put a ware with thick glaze in my father's kiln and was watching the color. My grandfather asked me if I wanted to work on celadon. "Yes," I said. My grandfather then passed me a Chinese Hakamagoshi Incense Burner from the Song Dynasty that he happened to have and told me, "I will give you this. Study this piece completely." My father did not allow me even to draw, let alone to make my own work, but my grandfather ordered me to work on celadon. Because my grandfather was acting bigger than my father (laugh), I got a legimate reason to begin making celadon. Someone who happened to see my work told me that the Palace Museum in Taiwan was the best place to study celadon and wrote a recommendation letter for me. I had opportunities to hold the works in my hands at the Palace Museum. Until then I had liked Southern Sung Dynasty works best, but when I saw celadon pieces from Northern Song Dynasty there, I thought I wanted to make that kind of work. That triggered me to start making celadon works for real. 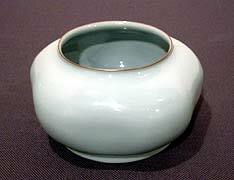 The reason why I was attracted to Northern Song Dynasty celadon was that I realized that celadon had a "warm" body that I had thought was cold. It gave me an impression of warm temperature to the extent that it could be dented when pushed. Since then, I have been wishing to make such celadon work. Q: You make pottery in Oiso, Kanagawa. I think that is a strange place for making pottery. Why there? A: Indeed there are few men in the same business around there. I am kind of isolated (laugh). In fact, my family used to have a kiln in Gojozaka, Kyoto before the war. My grandfather was born in Gifu and moved to Seto as an apprentice. In order to study more, he learned Chinese pottery under Miura Chikusen in Kyoto. But, Chikusen soon passed away which left my grandfather struggling in Kyoto. Actually, just before the war, he decided to leave for Gojozaka, Kyoto. If one was serious about making pottery in Kyoto, Gojozaka is the final destination for it is the center for pottery making. However, soon the war began and he had to give up living there because of the forced evacuation. As a result, he moved to Oiso, Kanagawa, because there was the Mitsui family's Shiroyama kiln established by Eiraku Zengoro. Currently, we have a kiln in Kokufu Hongo in Oiso. Q: Kawase Mitsuyuki, your uncle, is also a potter making Iro-sometsuke, isn't he? But only Mitsuyuki-san is still in Kyoto. A: The origin is from my grandfather's generation. The tradition, which lasted years, was my uncle and father were making pottery together in Kyoto, drawing was done in Oiso, and our clients were in Tokyo. My grandfather was overlooking all the processes. But little by little, all the processes got separated, and Kyoto was managed by my uncle and my father was handling Tokyo. I have been in Oiso from the very beginning, so I have no experience of living or apprenticing in Kyoto. Q: I heard that you bring clay from China. A: Yes, such as clay from Jingdezhen. I also use clay from other places. Currently I purchase it from a clay store. But what troubles me is that the quality of clay varies every time I purchase it, even if it came from the same place. It can be said of both Japanese and Chinese clay. Once I find clay I like very much and purchase the same clay at a different time, I find the shrinkage rate is slightly different. I know it cannot be helped because it comes from nature. So, when I find what I like, I get tons of it! Then I divide it up into hundred-kilo blocks and blend them differently. It is much work to manage clay, such as separating clay into different types. A: As I have said before, I craved for celadon from China's Southern Sung Dynasty, so when I started, I was trying to make similar work. I went to the Palace Museum with a pocket full of broken pieces of my celadon. I compared it finding it was a little bluer or had less of a shine, etc. After all, in my case, the foundation was my father's sometsuke. I had an advantage of testing celadon colors for we often fired our own kiln. Q: Does your blue come from the firing of iron? A: Yes, that's right. In the past, the blue came from iron found in nature, but now, I make a transparent glaze mixed with iron to make blue. Whether it is mixed with colcothar or iron oxide, the smaller the iron pieces, the better. Therefore, I used yellow sand (which consists of iron) carried by the wind from China, or confectioners gave me yellow sand that they used to make biscuits. Q: Does yellow sand contain iron? A: It contains a very strong iron element. Now I use magnetic powder used generally for magnetic tape for it is better to have smaller and stable iron. Q: Wow! You use such things as that material! It is going into a world of Fine Ceramics. So you are willing to use new materials without being prepossessed by tradition. A: If something turns out bad then I will discard the material, yet if I can achieve what I want I will keep using the material regardless of what it is. The Place Where He Ended Up was " Nature"
Q: Your works have unique shapes. How did you come up with the various shapes? A: In the beginning, I liked old Chinese pots, especially Sung Dynasty pottery, and made my works after them as I longed for them. As time went by, I began wondering what I should do to make works that are as good as, if not better, than Sung Dynasty. Then I began thinking it would not be enough to look and study just Sung Dynasty pottery. I should study one period before them. One period before means Tang Dynasty. Not only about pottery, the art of the Tang Dynasty. I decided to draw upon it. Q: Like metal, gyoku, etc.? A: Yes. Especially, in the case of the art of the Tang Dynasty, there are works of the same shape made of ceramic and metal. The metal pieces contain "sternness," and I was interested in that aspect. Then, many questions came up such as how the art of the Tang Dynasty was established. So I moved beyond to the period before (laugh). When I repeated this, I happened to wonder what was the real beginning or the complete incipiency of this. In the end, I reached the answer: "It's nature." So there were times when I was trying to get hints from flowers or animals. Q: Those ideas created your special works which are almost like natural shapes. A: And now as well. I get hints from both old works and nature, and I am hoping to do things more freely in the future. Q: I look forward to seeing more of your works. Thank you very much.